Bullis Charter School in Los Altos recently hosted and competed in a track ­and ­field meet for K-­6 charter school students throughout the Bay Area. 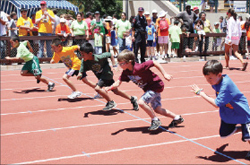 More than 700 elementary students participated in the second Charter School Invitational Junior Olympics June 6 at Stanford University’s Cobb Track. “We were thrilled to have the opportunity to partner with our fellow charter schools in an event that reached beyond our individual school classrooms and communities to give our students a tremendous athletic and character­ building experience,” Bullis Charter School Principal/Superintendent Wanny Hersey said of her decision to host the meet. Bullis Charter School reached out to nearby charter schools to help coordinate the event. Participating schools included Livermore Valley Charter School, Charter School of Morgan Hill, Escuela Popular Dual Language Academy in San Jose, Rocketship Sí Se Puede Academy in San Jose and Voices College­Bound Language Academy in San Jose. Echoing the traditions of the Olympic Games, students from all the schools participated in the opening ceremonies, which included a performance of the national anthem by school bands and a soloist, an athlete procession with school banners, a torch­passing ceremony by outstanding citizens from each school and rhythmic gymnastics to the music of “The Climb” by Miley Cyrus. The theme song was chosen to represent the philosophy of the event: Victory is not in the reward, but in the journey and the “climb” it takes to get there. The meet featured running relays (50, 100 and 400 meters), individual track events (100, 400 and 800 runs), standard field events (long jump, broad jump and javelin) and other events geared toward the youngest children (egg and spoon race, beanbag toss and basketball shootout). Between events, students participated in activities hosted by the Youth Science Institute. In preparation for the meet, participating schools provided students with athletic instruction and taught them about the Olympic tradition across their curricula. Students participated in a torch relay among the schools and a friendship bracelet exchange on the day of the event to encourage a connection to the other schools. In addition, the charter schools welcomed four local Olympians, who presented medals to participants. The Olympians included Sara Lowe (synchronized swimmer, bronze medal in the 2004 Olympics), Dana Kirk (swimmer, 2004), Christine Thorburn (bicyclist, 2000) and Ted Huang (windsurfer, 1996 and 2000). In keeping with the spirit of fellowship, Bullis awarded medals and ribbons to all participants and a citizenship trophy to the Voices College­Bound Language Academy for demonstrating superior sportsmanship. Lucretia Peebles, director of charter schools at the Santa Clara County Office of Education, was on hand to kick off the day’s festivities. “I applaud Bullis Charter School on their efforts to foster collaboration among charter schools within and outside of Santa Clara County,” she said.